Modern Taiko is a spectacular and energetic performance art form which is constantly growing and evolving through Taiko ensembles all over the world. It combines the sounds and rhythms of drums of all shapes and sizes with dramatic choreography and movement to create a thrilling and dynamic visual spectacle. 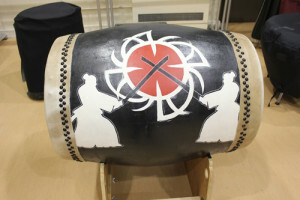 Taiko is similar in many ways to Japanese martial arts, and is a discipline based on key principles which instill players with a great sense of achievement and pride. Established in North America, modern ensemble Taiko drumming is only around 50 years old, but its origins can be traced back thousands of years. Taiko drums have been used in rituals and festivals, as well as to set the marching pace for soldiers heading into battle. Taiko is ideal for performance groups, schools, families, corporate team building and is a great way to keep fit! Taiko encourages a culture of respect, and players of all ages and abilities can work and grow together, developing self-confidence and strength of body and mind.